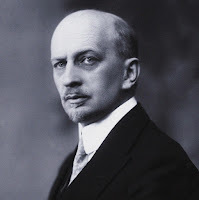 Camp 169: United Armed Forces of Novorossiya: Ivan Ilyin, "The idea of Kornilov"
From a speech in Prague, Berlin and Paris. First published in the Paris newspaper "Возрождение (Vozrozhdenie, Revival)", № 15 dated June 17, 1925. Today we turn our thoughts to the Russian national hero Lavr (Laurel) Georgiyevich Kornilov. While people are alive and as long as they believe in God, so long out of their midst heroes will arise to lift and carry on himself the burden of their lives. And as long as the nation is alive, which gave birth to such a hero, as long as it is alive and bearing in its heart the faith in God, it will turn its thought and its will to its heroes, loving them and honoring them, reflecting on their feats in its mind and accepting them in its will, so that to imitate them and continue their work. In the works of a national hero the life of the nation finds its concentrated and mature expression. And the nation understands it and follows after him. And if it not all of it follow and not at once, but first in the person of its best sons, then he whole nation goes on the path of its hero, recalling his image, saying his name and glorifying his work. The hero takes up the burden of his nation, the burden of its misfortunes, of its struggle, of its quest, and having taken up that burden, he wins - wins already by this alone, indicating to all the way to salvation. And his victory becomes a prototype and a beacon, as achievement and the call, the source of victory and the beginning of victory for everyone connected with him into one whole by patriotic love. That's why he remains for his people a living source of cheer and joy, and his very name sounds like victory. A national monument has not been erected yet by the Russian nation to Lavr Georgiyevich Kornilov. But it will stand next to the monuments to Minin and Pozharsky. We have nowhere to build it from stone and metal. But it is already built in our hearts ... And now, in a spiritual monument we have gathered to focus our thoughts on his deed. But not about the biography of Kornilov I want to talk about today and not about his personal character, but rather about something deeper, harder, more sacred: on the idea a bearer and incarnation of which he was; about the best heritage of its heroic spirit, about that what he carried in his heart and to what he called by his heroic struggle. This idea is more than a single man, more than a feat of one hero. 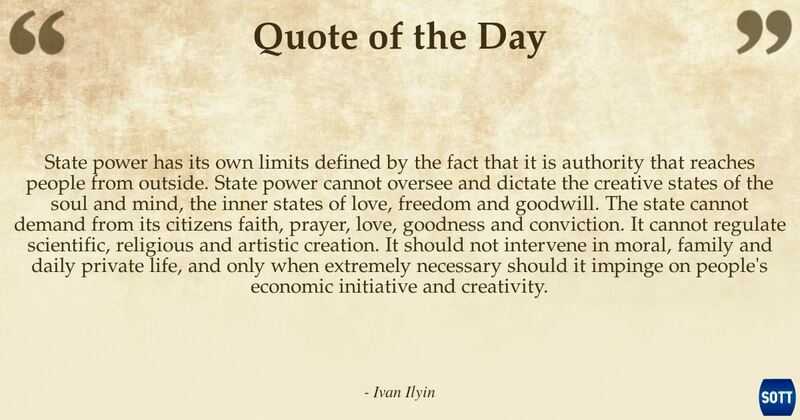 This idea is great as Russia and the sacred as her religion. This is the idea of the Orthodox sword. 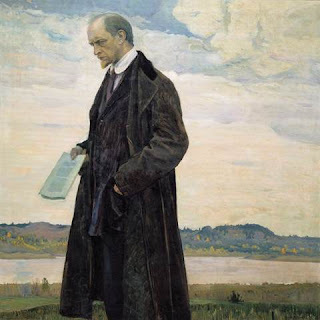 The idea is forgotten as an idea, lost from the Russian consciousness, desecrated by the Russian intellect; but it is preserved in the Russian heart and the Russian will. 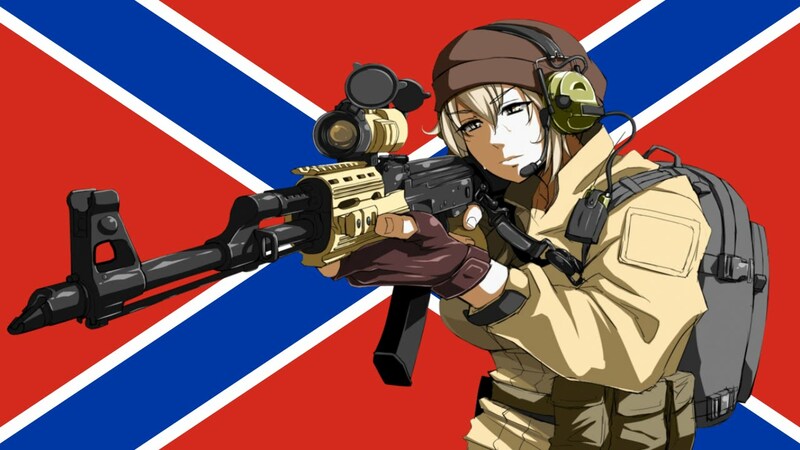 This idea inspired and created the Russian White Army: it sparkled in White hearts, to the death it lead our White heroes: and it will die only when Russia be gone from the face of the earth. On it I'd like to stop your attention today. One of the reasons for the great misfortune that has befallen our country is in the wrong structure of the Russian character and Russian ideology. Especially so in the broad ranks of the Russian intelligentsia. And then, in a kind of combination of limp sentimentality, spiritual nihilism and moral pedantry the pernicious doctrine of Count Leo Tolstoy "of non-resistance to evil by force" emerged and gained strength; the doctrine which had time to poison the hearts of more or less several generations in Russia, and undetected spilled into their souls and weakened them in the fight against the evildoers. Lured by this voice of sentimental morality, people began to believe in the untouchabilty of evildoers, extricated their strengths from the struggle against them, and presumed their valor to be in the timid acquiescence to Satan and his hordes of men; did not believe in the reality of evil, and buried themselves in the floor cracks in the hour of the death of our fatherland. And they came around only when the breath of death enveloped their lives from edge to edge. Could it be that in the suffering the Russian people did not grow wiser and will not grow wiser? Could it be that they cannot tell where is the revelation, and where is the lure? And is not each one of us called to seek this sagacity? And so, the first thing I had to establish in this study, is the true meaning of Christian love, the meaning misunderstood and distorted by sentimental moralists. Christianity teaches philanthropy. But calling to love man, it sees in him not an animal that suffers, but a spiritual being, turned to God as its heavenly Father. The gospel teaches above all and by all means to love God; and this is the first, the greater commandment; the love of man appears only in second place. And it's not just because God is greater than man, but also because only in God and through God, man finds his "neighbor" of his brother by a One Heavenly Father. To love one’s neighbor as oneself, can only one who found and firmed within himself the sonship of God, and only through that he can discern the son of God also in his neighbor. And having learned to love God, he naturally and necessarily will love in others His sons and his brothers. Gospel teaches us not animal compassion, but God-loving philanthropy, it teaches love spiritual. But spiritual love is something higher than usual compassionate humanity, relaxing one who is sorry, and one who is the subject of being sorry. Spiritual love is the power that informs and educates, that raises up. She loves in a man his face turned to God, not his villainous motives and actions. To love the evil, the evildoer, the Satan, to sympathize with them, help them, join them - is unnatural, disgusting and lethal. On the contrary, the evildoer is always in need of a firm "no", in the resistance that educates him, compels him, and if need be, represses him. In calling to love our enemies, Christ had in mind personal enemies of man, not God's enemies, and not blaspheming molesters, for them drowning with a millstone around their neck was recommended. Urging to forgive injuries, Christ was referring to personal insults to a person, not all possible crimes; no one has the right to forgive the offenses suffered by others or provide for the villains to offend the weak, corrupt children, desecrate churches and destroy the Fatherland. So therefore a Christian is called not only to forgive offenses, but to fight the enemies of God's work on earth. The evangelical commandment of "non-resistance to evil" teaches humility and generosity in personal matters, and not limpness of will, not cowardice, not treachery and not obedience to evildoers. In dealing with the evildoers a Christian should exercise the denying face of love: he is not called to love the evil in man or promote this evil. He is called to desire for everyone a spiritual transformation and enlightenment; but he does not have to extort from his soul a saccharine, mawkish feeling of tenderness at the sight of heinous acts. It should be enough for him to remember that great moment in history when God's love in the guise of anger and whip expelled from the temple the blasphemingly vulgar crowd; and after that he has to understand that all the prophets, the rulers, judges, teachers and soldiers should have in front of their spiritual eyes that image of righteous anger and not doubt the righteousness of their cause. May the will for this fight wake up in the Russian hearts! May it motivate the faithful sons of Russia as it inspired and led, and to this day is leading the Russian White Army! 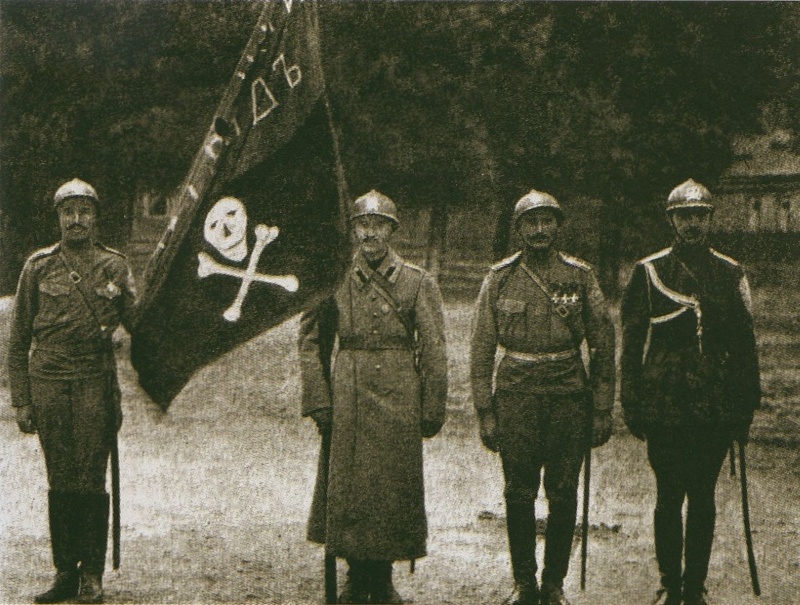 The flag of Kornilov is a banner of the heroic love of the Fatherland, the love donating all the comforts of the world for the national altars and planting before the eyes of a man the guiding images of Archangel Michael and Saint George. That is how the idea of love and the idea of sword was understood was understood in the ancient Russian Orthodoxy, that spoke from the mouth of St. Theodosius of the Caves: "Live in peace, not only with friends but also with enemies: but only with your enemies, not with the enemies of God." 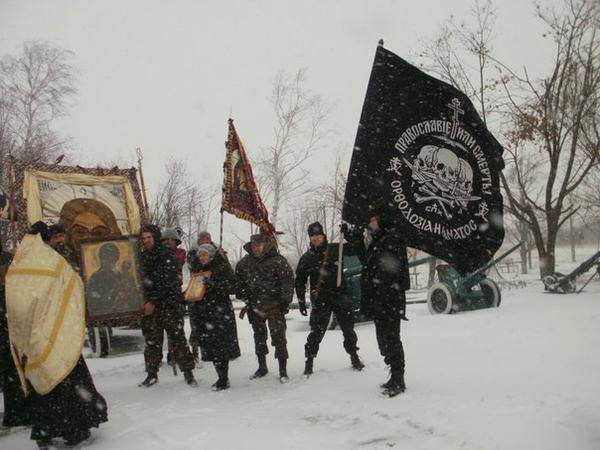 It is that love that was taught by our bishops and saints; this is how the sword was carried by the Russian Orthodox kings and their faithful nobles, this is how laid down their heads Orthodox soldiers. In this ancient Orthodox spirit our Russian national hero Lavr Georgievich Kornilov lived and fought. Let us be faithful to this spirit also. In it - our victory; our impending, certain victory ... For we win when our sword will be the love and the prayer, and our prayer and our love will be the sword!